Although the free movement of persons remains unpopular with the Swiss population and the desire for quotas is growing, the voting public is clearly in favor of Switzerland's bilateral agreements with the EU. Their popularity is declining, however, and for the first time a potential accession to the EEA represents an alternative approach which could attract a majority. This is one finding of the first Credit Suisse Europe Barometer, a representative survey conducted by gfs.bern on behalf of Credit Suisse and in collaboration with the Europa Forum Lucerne. For a majority of Swiss voters the continuation of the bilateral agreements remains the best available solution for shaping relations between Switzerland and the European Union (EU). This is the conclusion of the first Credit Suisse Europe Barometer, a representative survey conducted by the research institute gfs.bern on behalf of Credit Suisse and in collaboration with the Europa Forum Lucerne. The results are part of the 2017 Worry Barometer, which will be published on December 5, 2017. 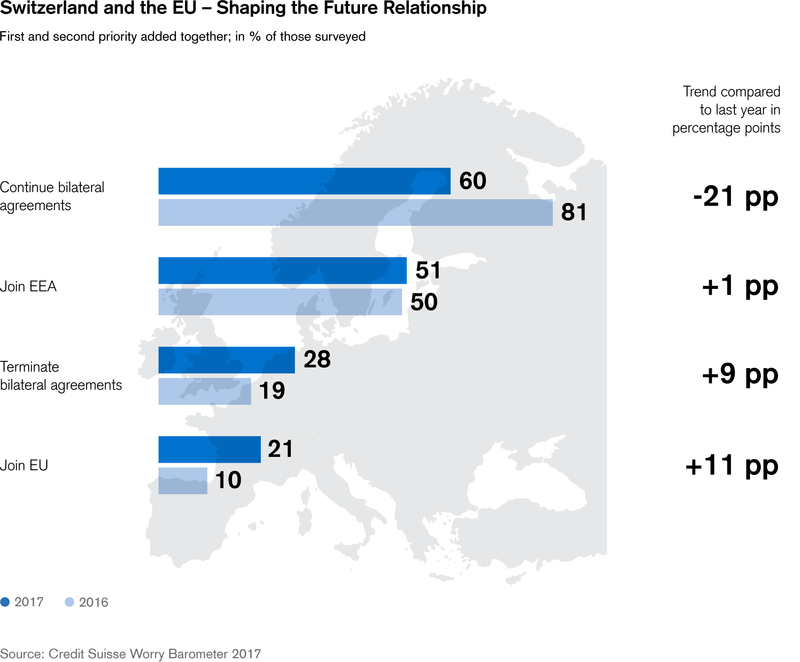 Asked what kind of relationship they want with the EU, 60 percent of Swiss voters name a continuation of the bilateral agreements as their first or second priority. However, the popularity of this approach has declined significantly since last year; in 2016, 81 percent of voters were in favor of the bilateral agreements. At the same time, 28 percent of those surveyed want to terminate the agreements, an increase of 9 percentage points compared with 2016. Joining the European Economic Area (EEA) is an alternative to the bilateral agreements capable of attracting a majority (51 percent) for the first time in 2017. The idea of joining the EU remains remote, with just 21 percent of voters in favor. Lukas Golder, Co-Head of gfs.bern notes: "Particularly in times where the bilateral agreements were under severe pressure – during the high-profile debate in the media about the implementation of the mass immigration initiative in 2016 – Swiss citizens were demonstratively in favor of the agreements. The current level of approval of the bilateral agreements is similar to that in 2014 and 2015, so it's possible to see this year's decline as a return to a sober assessment of the situation." A glance at the ranking of political objectives that are seen as very important or fairly important shows how contradictory the wishes of the Swiss population as regards the EU can be. Although a clear majority (79 percent) is in favor of using quotas to control immigration, an even bigger majority (85 percent) wants free access to foreign markets. There is, however, a broad consensus among respondents that promoting education is by far the most important political goal (97 percent). The goals of reducing greenhouse gas emissions (84 percent) and youth unemployment (82 percent) are likewise seen as extremely important. Although a majority of voters still express their support for the bilateral approach to the EU, the free movement of persons – an integral part of these agreements – remains less than popular with the Swiss. This is evidenced by the high level of support for immigration control by means of quotas. Moreover, 78 percent of voters see the Swiss identity being jeopardized by Switzerland's problems with the EU, including the negotiations on the free movement of persons. Immigration is perceived as a threat to Swiss identity by 77 percent of voters. On the other hand, the Swiss find it difficult to quantify the consequences of restricting immigration. While a total of 49 percent of people expect restricting immigration to have negative effects for the Swiss economy, 43 percent expect the opposite. 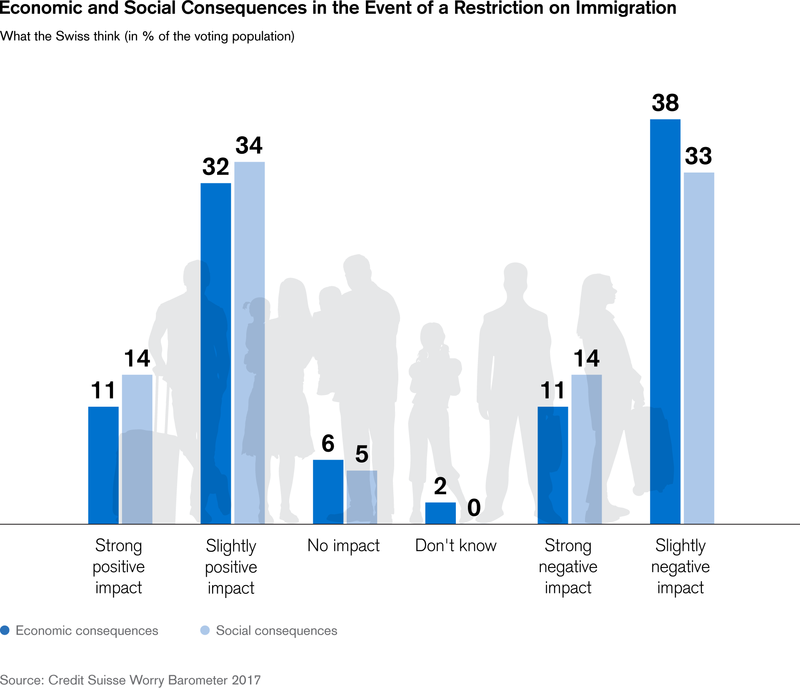 However, views on the anticipated impact of restrictions on immigration on Swiss society are more balanced with 48 percent expecting a positive and 47 percent a negative impact. "The fact that the positions are relatively balanced is an indication that the voting public has not reached a definitive opinion on this question yet," says Lukas Golder. The results of the Europe Barometer also show a great national sense of belonging among the Swiss. When asked what geographical entity they considered themselves part of primarily and secondarily, 56 percent of voters named Switzerland. The language region (55 percent) is a close second. The canton and the municipality where people live (41 percent and 25 percent respectively) are more infrequent answers. By contrast, very few respondents (11 percent) indicated that they felt a sense of belonging primarily or secondarily to Europe. Lukas Golder from gfs.bern comments: "The connection of Swiss citizens with Europe has no emotional component; the connection is primarily a pragmatic and an economic one." The first Europe Barometer survey was conducted in 2017 as part of a collaboration between Credit Suisse and the Europa Forum Lucerne. 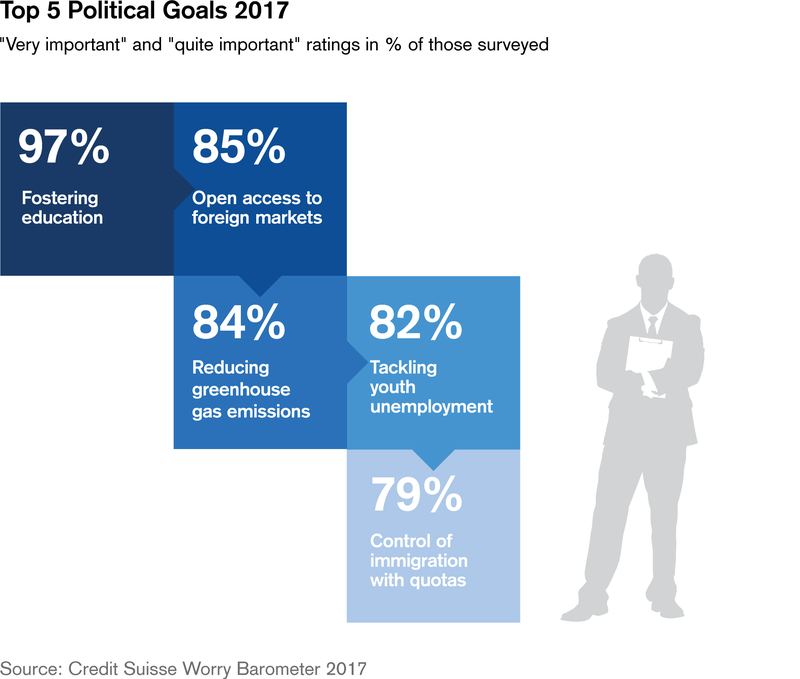 The results of the survey are based on the findings of the Credit Suisse Worry Barometer which has been asking questions about the main concerns of Swiss voters, their trust in political and economic players, and their identity since 1976. Respondents were asked about the relationship between Switzerland and Europe as part of the survey for the 2017 Worry Barometer. A total of 1,000 Swiss voters took part in individual interviews between June 26 and July 15, 2017. The new Credit Suisse Worry Barometer will be published on December 5, 2017. For more than 20 years, the Europa Forum has advocated the promotion of constructive dialogue with Europe as a means of strengthening Switzerland's position as a business location. As the leading event of its kind in Switzerland, the Europa Forum Lucerne provides neutral and independent information about the latest trends in Europe and their impact on Switzerland as a business location. Selected top representatives from the worlds of business, politics and science share their opinions and views on economic and political issues. The Europa Forum Lucerne takes place twice a year in the spring and fall.